1. 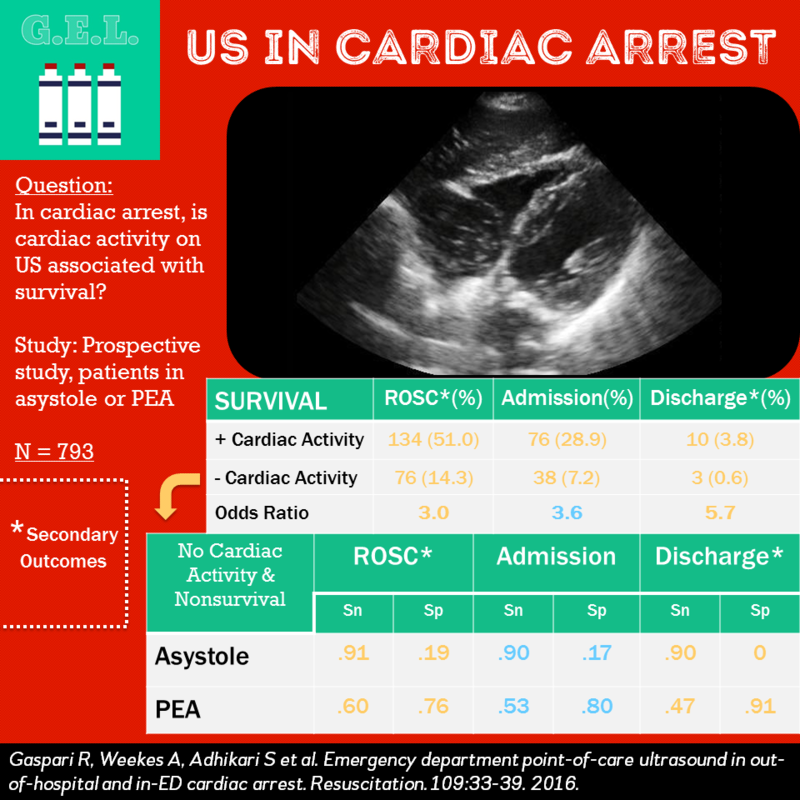 Cardiac activity on initial ultrasound in PEA or Asystole arrests is associated with increased survival to hospital admission. OR 3.6 BUT it is not sufficiently specific or sensitive. 2. Patient with no cardiac activity and initial rhythm of asystole have low chance of survival to hospital discharge. 3. Ultrasound may identify causes of arrest leading to intervention. Higher survival in group who received pericardiocentesis. Bedside ultrasound can be useful during cardiac arrest to determine if there is cardiac activity. While this is intuitive, the exact manner in which is should be incorporated into cardiac arrest algorithms is unclear. If there is no cardiac activity seen, does this mean that further resuscitation is futile? If there is cardiac activity, is it worth while to continue resuscitation until there is not? Although many people use cardiac ultrasound for decision making during arrests, there was not too much evidence for it prior to this study. Is sonographic cardiac activity associated with survival (or nonsurvival) in cardiac arrest? N = 793 analyzed over 3.5 years. This was the variable with the strongest relationship to survival at all end points. Asystole + no cardiac activity, characteristics for nonsurvival to ROSC - Sens 91%, Spec 19%. Other variables associated with increased survival are various end points = PEA, Bystander witnessed, Shockable rhythm. Patients who arrested in the emergency department had more survival to admission but not to hospital discharge. Average time recording ultrasound images was 4-5 seconds. Not blinded - ultrasound results could influence management. Patient may have been excluded based on having no activity on initial ultrasound which would exclude patient who may have survived based on the ultimate data. However, as noted by authors, if these were included it would have biased the results as well because they would likely have still stopped resuscitation based on ultrasound. No assessment of cognitive function of survivors. Survival to discharge is arguably more important end-point, but that was a secondary outcome. Confounding differences between groups. More bystander witnessed arrests and bystander CPR in group with ultrasound activity. Shorter downtime and longer resuscitations for patients with cardiac activity. Selection bias of sites. Since the resuscitations were not protocolized, there could have been differences. We don’t know how useful ultrasound would be in Vfib/Vtach arrests based on this data. Will cardiac activity on US lead to longer resuscitations or admission than necessary for no change in neurologically intact outcomes?